I will not participate again in the American Cancer Society Great Valley Relay for Life. Not because of the stupid marketing ploy on adding the Main Line to Great Valley when we are Chester County but because of American Cancer Society screwing with ‪#‎mammogram‬ guidelines. I am a survivor of Breast Cancer who might very well be dead if I had waited to start mammograms. Women should ‪#‎boycott‬ the American Cancer Society. Like Susan G. Komen they forget why they are here. I believe this is all because health insurance companies hate paying for preventative care like this and now health insurance companies all over this country will use this as an excuse to deny coverage. Get your mammograms. Get them annually. Have breast exams. Do self-breast exams. In a blink of an eye everything can change. I am living proof of this and a lot of my friends are as well. In the long-running debate about when and how often women should be screened for breast cancer, it is increasingly clear that one recommendation doesn’t fit all. (CNN)In a move sure to befuddle women — and anger some breast cancer survivors — the American Cancer Society has issued new guidelines saying less screening for breast cancer is better than more. 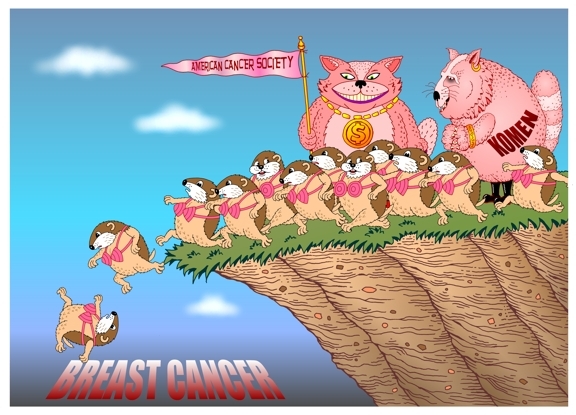 This entry was posted in breast cancer, health insurance and tagged Aetna, Beyond The Pink Moon, bogus breast cancer charities, boycott american cancer society, boycott susan g. komen, BRCA test, breast cancer, breast cancer awareness month, CNN, great valley relay for life, wall street journal. Bookmark the permalink. Hi Carla. I would like to include your opinion in a web article I am writing about confusion over mammogram guidelines. I am hoping to talk to you today if possible. Will you send me a email and let me know if you are interested? I can tell you much more about it. Thanks!